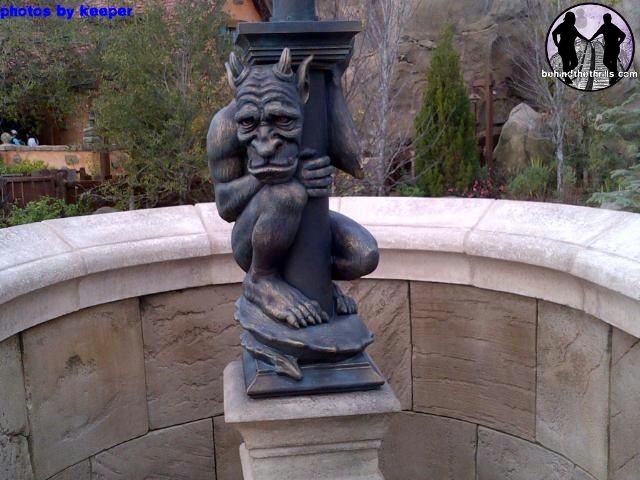 Greetings…You may call me keeper…for I am the keeper of theme park tales. 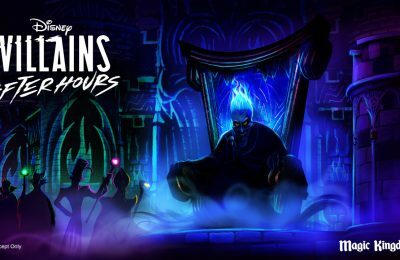 It’s no secret that for me, the theme park adventure is fueled by tales. Be it Sinbad seeking treasure or Pooh Bear seeking honey the story, almost without fail, brings a level of detail and fullness to the adventure unmatched by any other component. You can keep your bright shiny, noisy, coaster drops, for me its all about three things-story, story, story. For many years meal time took a back seat to story in theme parks. The fast food locations became vast food warehouses churning out burgers and fries as fast as the masses could gobble them up. 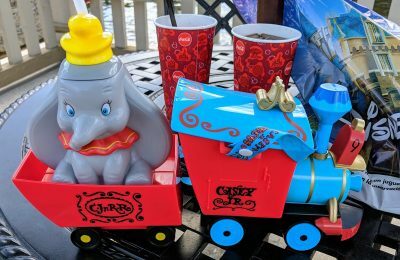 Although there are great sit-down locations such at the Prime Time Diner, The Hollywood Derby, Mythos and almost all of World Showcase the fast food locations didn’t evolve. 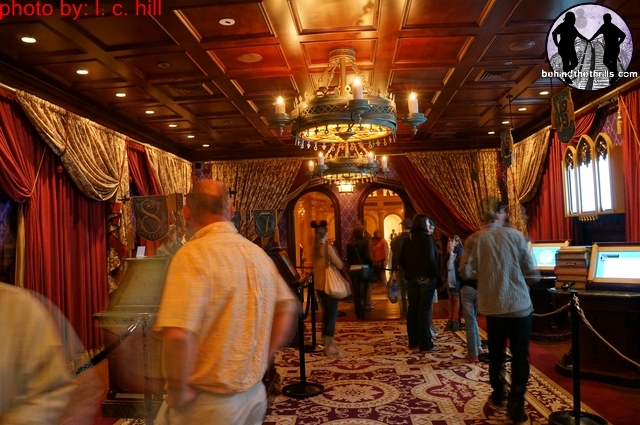 As time progressed décor helped add a bit to the story like in the colorful pizzafarii restaurant at Animal Kingdom or the amazing props and detail of the Monster’s Café at Universal Studios. The addition a few years back of Sonny Eclipse playing possibly the biggest food warehouse in existence, Cosmic Ray’s in Tommorowland, was an entertaining addition that helped tremendously. There were brief bits of light and progress as the years went by but no one completely committed to the level of theming and story in fast food restaurants that they did in the rest of the parks. After the holiday crowds had left I decided to storm the Magic Kingdom’s newest castle on a sunny day in early January. Now, if you’re looking for me to tell you the food was divine and had nutty hints in the bay leaves, you won’t find that in my tale. I’ll leave food reviews to someone with a more refined palette and instead, concern myself with the dining experience and how the story is tightly woven in every stone block and woven tapestry in the new Be Our Guest restaurant in New Fantasyland. The story begins on the approach; you see the castle rising above the land well before you arrive. After you clear the shadow of Cinderella’s Castle it becomes your focal point as you’re compelled to investigate. Getting closer you go under a broken archway and cross a bridge guarded by silent gargoyles. A quiet foreboding fills you that we may find things outside of the ordinary inside. 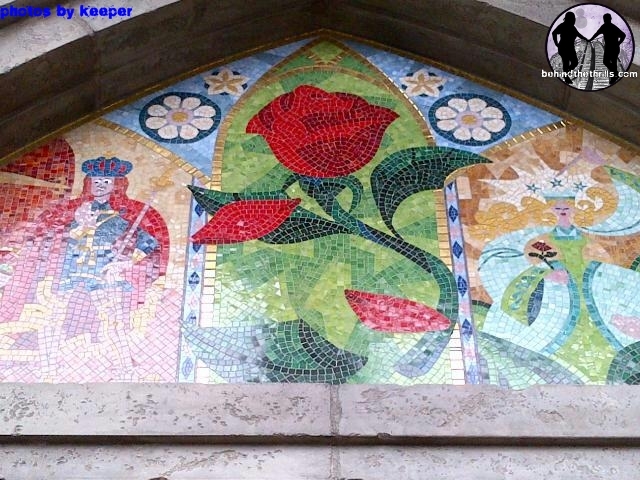 You go past a gate and are greeted by an attendant who opens the huge door and you pass inside under a beautiful mosaic mural that shows a young prince, an old beggar woman, and an enchanted rose. Once the door closes and locks behind you, your gaze scans the rooms. 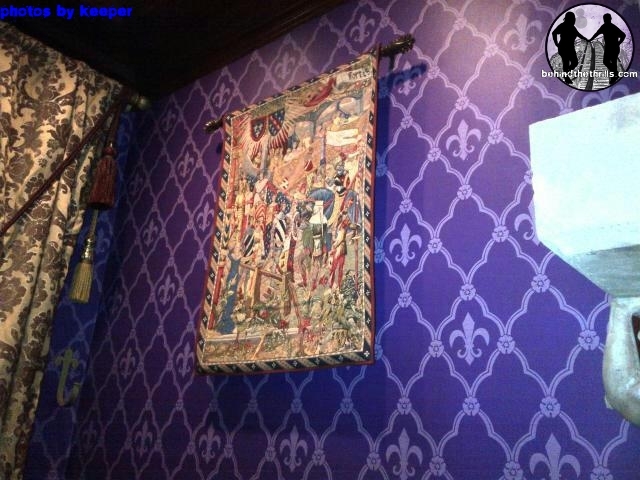 Beautiful tapestries contrast the cool walls and ever present gargoyles. It’s like there’s a mixture of good and bad somehow overlapped in this place. You walk down a hallway flanked by suits of armor. You hear low words from within, words just shy of your ability to understand them. 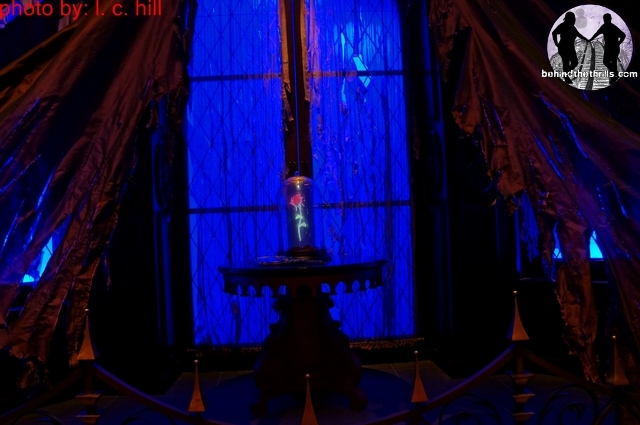 After passing them you find the first person since you were ushered in, a friendly attendant who welcomes you and hands you an enchanted rose. My friends, to say that I was enchanted by the single minded attention to story is a vast understatement. My heart was full with this place and what it represented and I hadn’t even ordered my food yet. 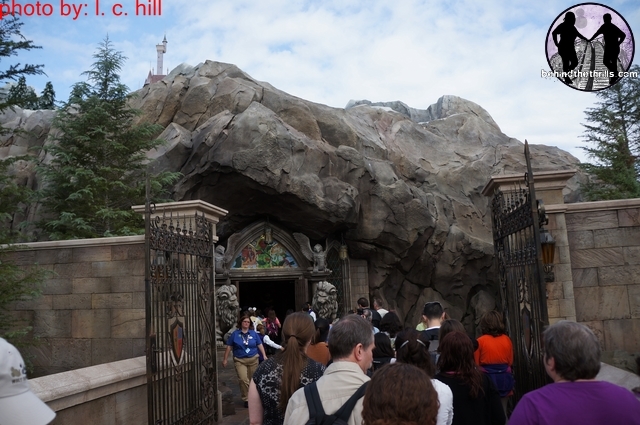 The mood was set and my expectations were soaring…but it seems that this entrance was just the prologue to our story. Come with your pal Keeper, let’s continue to explore. After I got my rose I walked into the area to order. This was not the usual register and counter set up. It was a warm inviting room. Obviously existing in a time when there was no curse upon the castle. There was a fire in the fireplace and the colors were deep, rich and inviting in contrast to the entranceway. A CM asked if I was paying cash or credit, I opted for the later so I could experience the process. There are 2 attended registers with the left/right ordering line thing that is standard and 5 self-serve stations. When you walk up you touch your rose to the station then begin your order. The menu choices were teased to you in picture form by 3 monitors in the armor gauntlet and in this ordering chamber there are illuminated menu boards in addition to your touch screen. 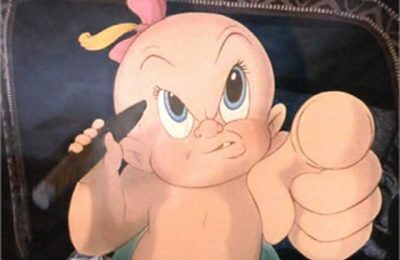 The process is similar to the do it yourself stations at other Disney fast food, excuse me QUICK SERVE restaurants and was an easy process. After you order, the room funnels you into the ballroom. It was one of those jaw-dropping moments to actually BE in such an iconic place. I can only imagine the reaction that the little princesses must experience walking into this room. It’s all here: cherubs on the ceiling, chandeliers, music playing, and outside the wall of windows, the dark rocky tertian with a flurry of snow coming down in the night sky. I can imagine a seat by these windows being the perfect romantic spot for a special dinner. This is the largest dining area, the other two are set to either side of the ballroom at the far end and one wall has the drink fountains, cups, and condiments while real cutlery was at the entrances between rooms. To the right of the ballroom, is a room about half its size was a room that I thought was supposed to be the library. Since it had no books I will refer to it as the music box room. 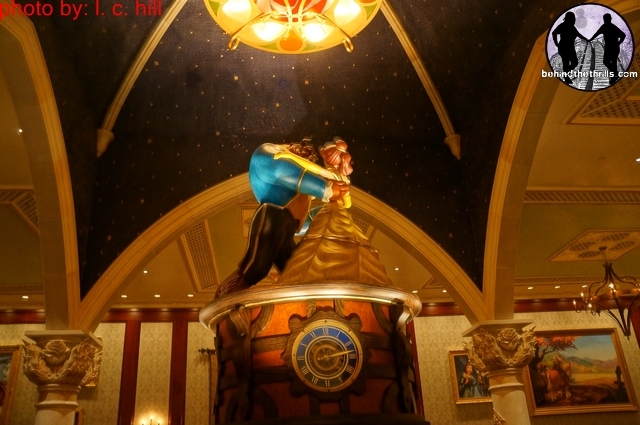 The centerpiece is a giant music box with an almost life size statue of Belle and Beast waltzing on top. 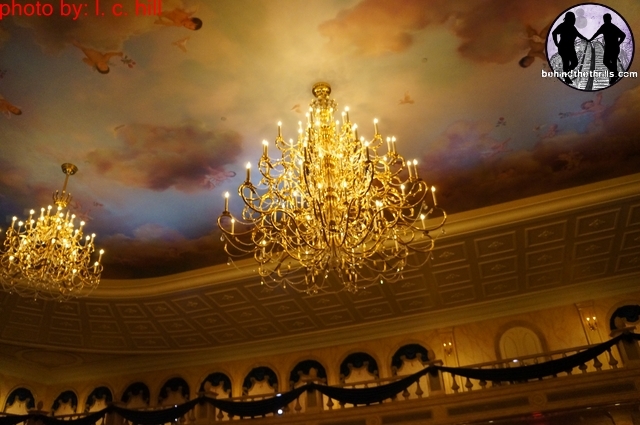 The music box versions of “Be Our Guest” and “Beauty and the Beast” sync up perfectly with the orchestrated versions in the ballroom making a pleasant effect as you walk from one room to another. 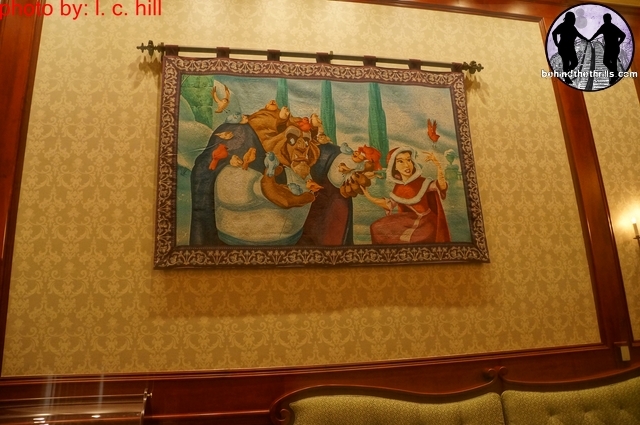 The music box room also has large pictures of all your favorite characters from the movie. This is the only area that didn’t quite make sense to me. The music box itself was very impressive but the room just gave me the feeling of being unfinished or the victim of cost savings measures, a small complaint in this big picture but took away a tad from the story. To the left of the ballroom, at about one-third its size is the crowning jewel of the experience, the west wing. It’s all here, dark foreboding lighting and music, a slashed portrait, ripped hanging tapestries and in front of some dark windows, the enchanted rose. Although I was near the front of the line when we went in, while I was exploring the castle others rushed to stake out a table in the west wing so I could not experience a lengthy visit but methinks the imaginers underestimated the appeal of this room. The rose floats and glimmers, lightning flashes, a petal drops and a very different image peeks thru the damaged portrait. I finally found a spot in the ballroom where I could enjoy my meal and observe when an attendant wheeled up a serving unit to my table and said “may I see your receipt please”. I jokingly said “I thought the magic rose was supposed to identify me” and she jokingly quipped “I’ve been following your magic rose all around the restaurant for about 15 minutes now”. Ahhh the magic of RFID (http://behindthethrills.com/2013/01/keepers-talesrfid-isnt-technology-its-magic-and-its-spreading/) strikes again. While I was leisurely wandering about she was tracking my rose on a hand held device from room to room. When I stopped in the music box room she too headed that way only to find once she was there that my rose was in the west wing. We both laughed about it and she confessed that I was not the first to forget about my food while exploring. As I sat and ate I marveled at the attendants dashing around the room rolling their carts and serving hot food to hungry guests. When I say dashing it was difficult to find one standing still enough to snap a picture but I finally found someone serving and not dashing for you to see. The thing that I marveled at was the accuracy of the roses. They did not only go to the right room but directly to the right table repeatedly without hesitation, I’m sure there was some observational common sense (I have 4 entrees I’m not going to the table with two people) but I prefer to think it’s just another enchantment. The ones not serving were welcoming guests at the thresholds of each room and I even heard an attendant serenading a couple with his version of “Be Our Guest” accompanied by the music box. 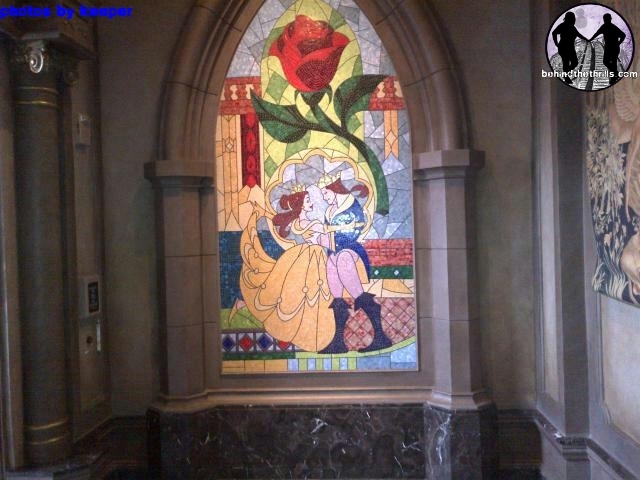 Right near the exit door was a mosaic of the final glass window in the movie depicting the happy ending and enticing happy guests for one final picture to document their visit to this special place. The castle seemed to depict the story from beginning to end, you would think that parts being in pristine (pre-Beast) condition and others in disrepair would seem disjointed but it was a carefully woven tapestry that overlapped and gave hints and references to different parts of the story masterfully. As I was taking my last stroll through the rooms I bumped into my server who laughed at me wandering toward the exit and wished me a magical day…like she knew.